The Saguenay-Lac Saint-Jean region is certainly well known in Quebec for its wild blueberries and big lake. In fact, blueberries are such a prominent part of the image that everybody from region is known as a bleuet (blueberry). But the region, a two-hour drive north of Quebec City, the provincial capital, is rapidly becoming famous as a little bit of cycling heaven. The flat terrain surrounding the huge lake, the remnant of an ancient salt-water sea, is perfect for all levels of cyclists, from young families to experts and even their grandparents. 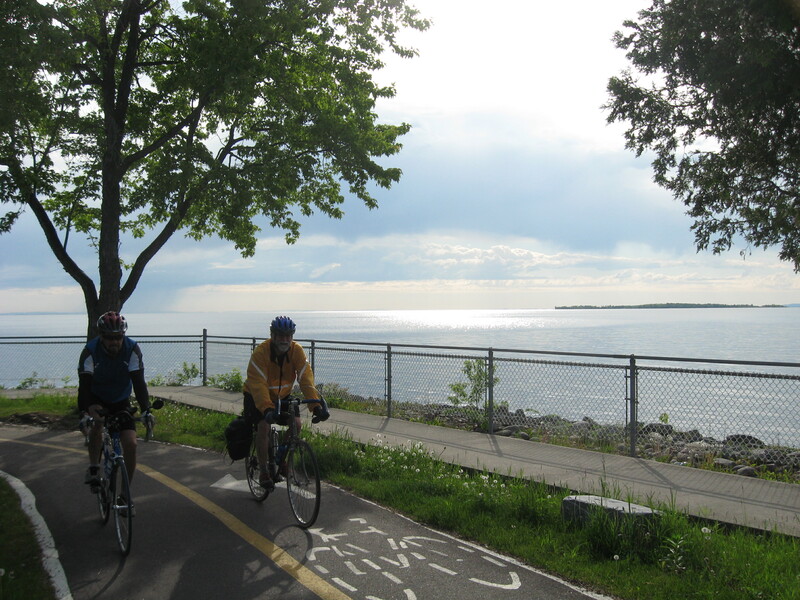 There are wide highway shoulders and dedicated paths, sometimes running parallel to each other, for cyclists making the Véloroute des Bleuets (Blueberry Bike Path) a crown jewel in the Quebec’s cycling network, which is now pushing 5,000 kilometres. And the region is known as the Kingdom of the Saguenay – an entity unto itself, because of its isolation from the rest of the province. It has many small towns, a profusion of fields of cultivated low-bush blueberries once found only in the wild, outstanding dairy products such as organic cheese and a proliferation of the family name Tremblay. A circuit of the lake – just over 250 kilometres – takes riders past the endless fields of blueberries and stacks of white bee-hive boxes whose inhabitants pollinate the plants, farms with bucolic pastures feeding grazing dairy cattle and cheese factories churning out blocks of organic cheddar and squeaky curds. 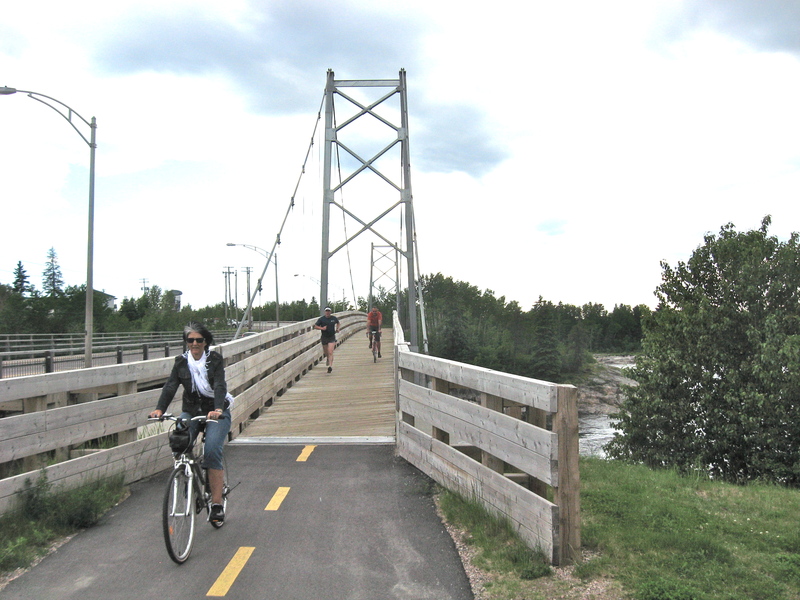 Suspension bridge alongside busy boulevard accommodates cyclists and joggers in Dolbeau-Mistassini. The path travels over a dam of the giant Rio Tinto Alcan aluminum plant at Alma, swings over the Peribonka River on a boardwalk several hundred metres in length near Sainte-Monique and is assigned designated lanes on the streets of the tidy and prosperous towns. Everyone seems to be pitching in to make cycling comfortable and pleasurable. For example, a suspension bridge for cyclists, joggers and walkers has been built alongside the vehicle bridge on Blvd. des Pères over the Mistassini River in Dolbeau-Mistassini. The terrain was idyllic for our group of eight – including six grandfathers and ranging in age from late 50s to 76 – which travelled the circuit in the late spring. Our most senior member was Ralph Kendall, a native of Montreal and now a resident of Ottawa. A world traveler, Kendall, has climbed Mount Kilimanjaro in Tanzania and hiked the full length of the Appalachian Trail in the U.S. Five of us trekked to Everest Base Camp in Nepal last October so we are accustomed to this kind of trip. What follows is a day-by-day account of our journey, which covered a total of 460 kilometres including the distance from Chicoutimi to the lake and the ride along Highway 172 from Chicoutimi to Tadoussac. Monday: After driving from Wakefield, Qc, Ottawa, On, and Montreal, we arrive at the Motel Panoramique on the Saguenay River in Chicoutimi. We head downtown for a so-so supper, which includes a big glop of cheese on pasta. On our return to the motel, our eyes are attracted to the river where rocks have been bared by the outgoing tide. It rises and falls four to six metres. Who knew there was a tide here? It’s a discovery for our group. Tuesday: My friends pedal up a steep hill to reach Route 8 of the Véloroute des Bleuets, which will take us around the lake. We leave two cars at the motel and I drive the support car stuffed with our bags, spare tires and tubes so it’s no sweat for me. The gang rides past the huge Alcan Jonquière facility with its many stacks and into the countryside. We pass forests and farms, arriving in Hébertville, the cradle of Lac Saint-Jean, for lunch. We change drivers and it’s my turn to ride. The lake comes into view at Métabetchouan and we proceed through Saint-Gédéon to Alma where our leader, Bob Johnston, of Ottawa, has reserved two townhouses at the Complexe Dam-en- Terre overlooking the lake. (Before the trip, Johnston made advance reservations for accommodation at each stop taking that chore off our hands. Archie Smith, of Wakefield, Qc, takes his bike to a shop where the chain is repaired for $12. The bike, of unknown vintage, cost him $10 at a recent garage sale. The repairman says he would have liked to replace the chain but he no longer stocks chains for the old 5-sprocket rear cassette. The distance from Chicoutimi to Alma was 120 kms. Wednesday: We ride in light rain through the pretty neighborhoods of Alma and into the country, hitting the trails and shoulders of Highway 169. Some guys take the trail through the beautiful Parc national de la Pointe-Taillon and others continue along Highway 169. I stop for lunch as the sun begins to shine at the Saint-Monique municipal park and pick up the bike path for the section along the boardwalk over the Peribonka River into the village. The path runs parallel to Highway 169 past the farms established on the flat terrain on the east side of the lake. The highway is called Route Maria Chapdelaine and eventually I come to a little house that is the Louis Hémon Museum, a tribute to the French author who wrote the novel about early pioneer life in the region. It met large success after Hémon’s untimely death at the age of 32 in northern Ontario. The novel has been turned into three films, the last one (and the only Canadian version) starring the lovely Carole Laure. We cover 85 kms and land at the Motel Diligence in Dolbeau-Mistassini. Thursday: We continue to follow Highway 169 and the bike paths through Albanel and Normandin to Saint-Félicien where we pop in to the Fromagerie Ferme des Chutes for fresh organic curds from the milk of Holstein cows. I have the curds for lunch while sitting on a bench in front of the Caisse Desjardins (credit union). We cycle along paths to Roberval where we stop at Camping Mont-Plaisant after covering 85 kms. Friday: We follow the paths through Roberval and the countryside to Métabetchouan and then leave the lake heading to Hébertville for lunch. It rains heavily for the rest of the day to Chicoutimi. In all, I did 120 kms because I overshot the motel and had to double back a few kilometres. We plan to have dinner at a steak restaurant, but it is full and we end up at an eclectic little spot called Sud Café run by transplanted Peruvian Marcos Germa and his Quebec wife Suzanne. After we arrive, Marcos shuts the restaurant, which is full of his artwork, and the couple serve us a potent Peruvian aperitif called pisco containing mango juice and something stronger. What follows is a superb meal of corn and cilantro soup and, in my case, saltido beef whipped up by Suzanne, who has mastered Peruvian cuisine. Saturday: We follow Route 8 and its long climbs along Highway 172 to Tadoussac. We end up at the nearby Innu-Montagnais Indian reserve of Essipit where we spend the night in two A-frame cottages overlooking the St. Lawrence River and its whale population. We dine at the Poissonerie Les Escoumins, the reserve’s restaurant attached to the Pecherie Manicouagan, which sells fresh seafood. I have clam chowder (the clams are called mactres de Stimpson) and fresh turbot caught on the north shore. It may be the best seafood meal that I have ever had. And that’s saying a lot because I have had fresh seafood meals from the Yucatan Peninsula of Mexico to Newfoundland and Vancouver, B.C. The go-to guide for cyclists is one entitled Route Verte du Québec available in English as Cycling in Quebec ($24.95). It can be ordered online at velo.qc.ca and contains excellent maps of paths, lists of bike shops and accommodations such as camping, cabins, gites (bed and breakfasts) and motels along with public transport such as taxis and intercity bus companies that can get you and your bike to the regions where you want to cycle. Cyclists can do the circuit around Lac Saint-Jean in as little as three days, beginning and ending at Alma, for example. Chicoutimi is a two-hour drive along Highway 175 from Quebec City. Sud Café, 317 Racine Est, Chicoutimi, 418-549-5777. Poissonerie Les Escoumins (Pecherie Manicouagan), 152 Marcellin Est, Les Escoumins (Essipit), 418-233-3122.